Calcium is an important element in bones. For healthy bones, it is reccomended that calcium be brought in via the diet. However, Vitamin D is also needed to help the calcium absorb properly into your body. Calcium is a major ingredient in bones. For healthy bones, the reccommended daily allowance of Calium needs to be brought in via the diet. However, without Vitamin D – calcium is of no use! Vitamin D – normally produced by humans in the skin via direct sunlight – helps the absorption of Calcium into the body from your food. Some countries, i.e the UK, low levels of sunlight has caused many people to suffer from bone related illnesses, joint pain and simple fractures. This single tablet taken daily can provide the minimum daily allowance of each ingredient to help strengthen you bones. 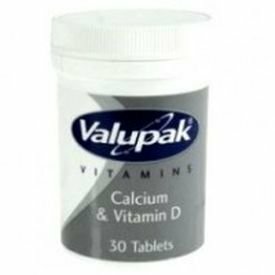 Valupak Calcium with Vitamin D are free from added starch, gluten and yeast. No artificial colourings, preservatives or additives of any kind are used.